Matador does a thing called Buy Early Get Now for certain forthcoming releases, where they encourage you to preorder the album in exchange for not only being able to stream the whole thing as soon as you pay for it, but also more extras when the album hits stores. I've done it a few times: once for Stephen Malkmus' Real Emotional Trash (for which I ended up getting a live recording of a show that I was at, which was sweet), and again for Pavement's Brighten the Corners: Nicene Creedence Edition. The Brighten the Corners deal was a scorcher. Not only was I able to listen to the entire thing a month before it came out (only on my computer, but I'm in front of this damn thing all the time), but they also dished out two rare tracks that didn't make it onto the final release (an alternate take of "Westie Can Drum" and a great live version of "Transport is Arranged"). On top of that, they included - in my mailbox the day it dropped - a live LP of a Pavement show from 1997, a poster, and, of course, the two-disc set that was the initial reason for the whole thing anyway. The live LP is vinyl-only, and as far as I know, only available through this deal. (Though I think I've seen it popping up here and there since.) And, if you haven't put it together, it's the one we're talking about here. And it's pretty great. 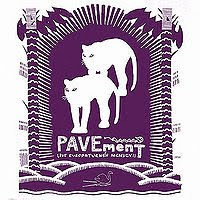 In typical Pavement fashion, the cover art is more form than function, with the song titles only being listed on the actual LP, and even then, some of them use completely different titles and the other ones use alternate spellings. Whatever. If you know the band you'll know these songs, and it's a nice offering of stuff from everything except the last album, which hadn't come out yet. There's a great version of "We Are Underused" (here inexplicably titled "Joe Boyd (Stringband)"), and rousing takes on "Stereo," "Loretta's Scars," and "Shady Lane." I'm not sure that it's an entire show, but it makes for a great little live recording. And anything that's a limited edition and "vinyl-only" makes me so, so happy.